Like many Laker fans, I thought this was the season they would finally get back into the playoffs. Ever since the dreaded Dwight Howard season, they’ve had to weather four sub-30-win seasons, Nick Young step-backs and Byron Scott. The Lakers have started players with names like Shawn Williams and Ronnie Price, and, my personal favorites, the garbage-time twin towers, Ryan Kelly and Robert Sacre. We’ve played male hair icon Carlos Boozer, NBA dinosaur Roy Hibbert, and friend to all pandas, Metta World Peace. Through these trying seasons, people rode the Kobe-captained tank, great protections on that pick to Phoenix, and great scouting to build a nice young core of talent, highlighted by Lonzo Ball, Brandon Ingram, Kyle Kuzma, Josh Hart and Ivica Zubac. Things were finally looking up after the 35-win 2017 to 2018 season where they would have made the playoffs had Lonzo and Ingram not missed 53 games combined. The Lakers entered the offseason with a boatload of cap space, a nice young core, Magic Johnson as our president, and the allure of Los Angeles to convince free agents to join our team. 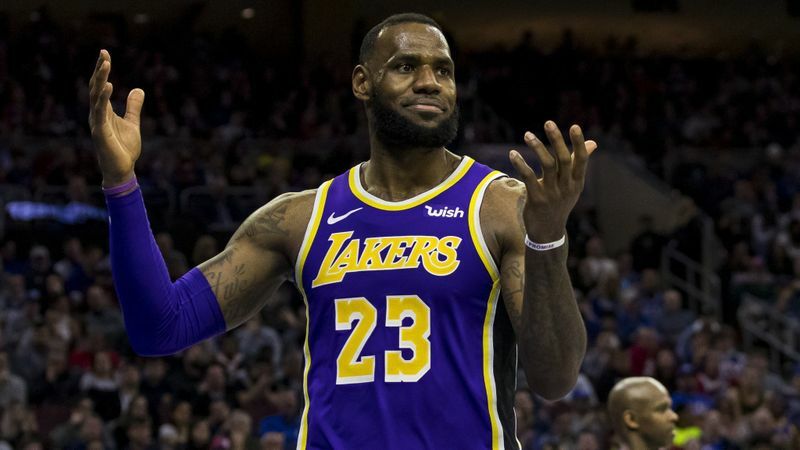 While people struck out on Paul George, the Lakers landed LeBron James, the best player in the NBA. It’s like losing a dollar but winning the lotto. Like many Lakers fans, I immediately thought finals. “If LeBron could lead that Cavaliers team to the finals, he can lead this rapidly improving team to the finals,” I thought. I entered the season, basketball innocence restored, anxiously anticipating the playoffs. The Lakers lost the first couple of games but I wasn’t too worried. It takes time for a team to get around James and Ball was coming back from an injury. One game in particular though, made me question my confidence. It was Oct. 22, 2018 against the Spurs. The Lakers had battled back from a eight-point deficit with a minute left. James hit a beautiful pull-up three to send the game to overtime. In overtime, the Lakers absolutely destroyed the Spurs. Two-way player Johnathan Williams shut down LaMarcus Aldridge and we kept forcing turnovers and getting out in transition. Things were going so well, even Lonzo hit a three. We were up by six with under a minute left. Down by four points with 20 seconds left, DeMar DeRozan drove and the Laker defense collapsed. Williams stepped up from Aldridge trap DeRozan and Hart stepped up to stop the Aldridge roll. Lonzo played off Patty Mills in the weakside corner, hoping to force DeRozan to attempt a heavily contested shot or throw a pass at an extremely awkward angle. Kuzma covered Bryn Forbes in the ballside corner. The one person not actively guarding anyone was James. He absent-mindedly walked into the paint as the defense collapsed, forgetting the trailing Rudy Gay. You can literally see DeRozan’s head and eyes turn towards Gay as James, his team, and the the audience knows what’s about to happen. DeRozan jumps, passes the ball, and Rudy Gay hits the wide-open, uncontested, three-pointer. James actually didn’t even contest the shot. You can’t say that James couldn’t have contested the shot. As one of the most athletic players ever, there’s no excuse for him to not have simply put his arms up and jump to at least contest the shot. If I googled the dimensions of a basketball court correctly, James was about three feet away from Gay when he got the ball. To make matters worse, it was James who choked two free-throws the very next possession, leading to the Lakers only leading by one and the subsequent Patty Mills game winner. There’s been the same knock on James for years in Cleveland: he doesn’t play defense anymore. It’s been okay because we understand how much he does on offense. But on the Lakers, I hoped it would be different. I hoped that playing with young players that actually care about defense would convince James to actually care about defense and remind everyone how he was able to shut down MVP Derrick Rose. Watching this game, I realized that James really doesn’t care about defense anymore. When Kevin Durant hit that game winner over James in the 2017 finals? That’s the James the Lakers have had to cover again and again on defense this year. This play against the Spurs is a microcosm of LeBron’s horrible defense this whole year. If Kuzma needs to tell you to stay on your man, you know you’re doing something wrong. James’ lack of effort on defense points at a bigger problem: his leadership of the team. How can Laker fans expect the rest of the team to play to play defense when their best player isn’t playing defense? The whole Anthony Davis trade saga showed just how bad of a leader James is. Knowing that multiple players on the team were included in the Pelicans’ trade demand for Davis, James shouldn’t have been so public about wanting to play with Davis. He told ESPN it “would be incredible to play” with Davis, laughed about wanting Davis to be his teammate during the All-Star draft, and even tweeted asking about any trade rumors during the Super Bowl. James’ comments and the whirlwind of trade rumors made many of the players feel like they weren’t wanted, and their play showed. Being that James amplified the distraction he’s talking about, these words are pretty hypocritical. James killed the Lakers’ chemistry. On a team full of volatile veterans and young players vying for playing time, a combination of injuries, trade rumors and bad leadership killed the chemistry. Now the Lakers are officially eliminated from playoff contention. Laker fans like me that have waited five Byron Scott and Nick Young filled years are on suicide watch. With this waste of season, I think our LeBron James experiment is over. We should trade James. Been advocating for this since the trade deadline. Should have sent him to New Orleans for Anthony Davis. The young core with Anthony Davis as an anchor would be extremely attractive to free agents.